On a dirt road marked by haunting secrets, three strangers caught at life’s crossroads must decide what to sacrifice to protect their own agendas…and what they’re willing to risk for love. In this second book of the RANSOM CANYON series called RUSTLER’S MOON, I wanted to add a mystery whispering through my story. When I began RUSTLER’S MOON, Angela Harold runs from the pain of loss of her father and the only home she’s known to a new beginning in Crossroads, Texas. She meets a rancher who’s given up on dreaming. Their story weaves in and out of the lives of the people in Crossroads. Sometimes a character steps onto the stage of the book and surprises the writer. Carter did that for me in RUSTLER’S MOON. He’s a man who thinks his life is over but holds on to his one goal of finding a childhood memory. I loved the way Carter’s story wound around Angela’s mystery and the surprises he finds not only in the canyon, but also within himself. Come along on a journey of new beginnings filled with suspense and finding forever love in RUSTLER’S MOON. You might just fall in love again for the first time. 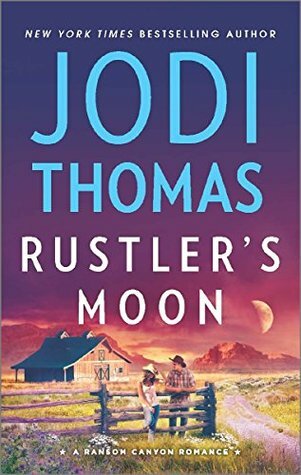 Rustler's Moon is #2 in the delightful series by Jodi Thomas. We continue on - meeting some newcomers and some more of the descendants of the early settlers who first started this community. There are really three prongs to this book, as it follows the lives of three groups of people, yet as it is a small community minded place, of course they all interact with each other as well. There is Angie who has come to take up a new job in the museum, and what a joy that must be, could feel myself wishing it was all real and I could go view the place and all those early artifacts. Angie lost her mother at an early age, and when her father was mugged and murdered she leaves town quickly, as her life could be in danger. Arriving in the community its not long before she meets Wilkes who runs a ranch and who has living with him his Uncle Vern. Uncle Vern is a bit of a character and he gave me a few out loud laughs. He is a bit of an old codger, thinks he would still be a catch with the women, and besides he knows what to look for in a woman. Also - no flies on him! Wilkes is a delight - a good homespun honest, down to earth guy. He soon sets himself up as Angie's protector and well if Uncle Vern doesn't get there first - he is rather hoping to get significant time alone with Angie. We also get to meet again Yancy, the guy who turned up last book - straight from a jail - and who weaved his way into the hearts of a local retirement community. His story advances with some exciting developments, my favorite moment being between him and Angie. Angie of the compassionate heart. As well we also track some young college people, Lauren, Reid and Tim, the three who were mixed up in the break in to the old house in the previous book. Now they are wending their way through college, along with Polly, Lauren's room mate. And as Jodi Thomas mentions there is Carter, who is seeking something, and he has never given up on it. Will he be rewarded? I love the depth Jodi Thomas brings to her characters, and the chance we have to see them developing over a period of time. It makes for very satisfying reading. Some relationship angst, some mystery and danger, a long time quest to be fulfilled. Great mix of a story. When not working on a novel or inspiring students to pursue a writing career, Thomas enjoys traveling with her husband, renovating a historic home they bought in Amarillo and “checking up” on their two grown sons. For more information, please visit Jodi’s website. 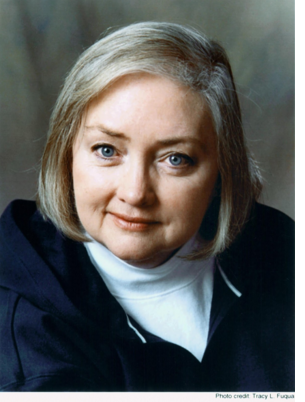 Kathryn, great review and I have't read her. But I love western romances. Thanks! Debbie Jodi T writes wonderful characters I just fall in love with. I'm trying to read more romance these days, so I might have to track down book 1! This is really quite light romance and more an exploration of people and their lives. I have never read her work. I have her added to my list for the first of this series. This year I plan to try more new authors. Yes anyone of her series is worth it, there is another one I adored, - her Harmony series. I actually have Ransom Canyon #1 on my wishlist for a few months. Now that you mentioned this new one I'm going to look for it. Though I've never lived near Texas or "cowboy country" I enjoy the occasional foray into it-- Longmire, CJ Box etc. Thanks, Kathryn and thanks Ms. Thomas! This is really light on the western aspect although the prequel and #1 is more so. Worth getting into. This sounds like a great series! And I like the idea that it follows multiple characters. I'm glad you enjoyed this one! My usual go-to for cowboys is Catherine Anderson, but I'm excited about trying Jodi Thomas' books now! Ha I love Catherine Anderson books, get me in a reading slump and give me a CA book! Jodi T is different but equally as good. This sounds like my kind of book! I just your description of the museum and I like ensemble style casts with intertwined histories. I definitely need to add this series to my TBR. Yes JT is excellent with ensemble casts. Some authors do it better than others. JT is a master at it. I love series that are set in small towns!